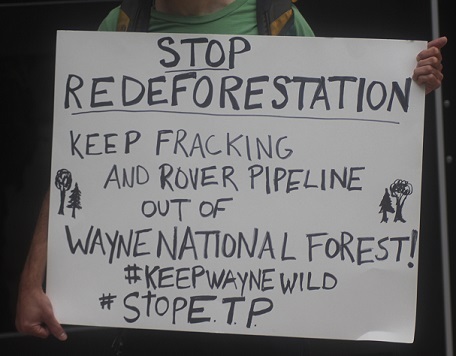 The Federal Government has expanded it's destructive sweetheart deal with energy conglomerates to lease National Forest land for fracking in the Wayne National Forest. They have added an additional 2,000 acres of leases to the oil and gas leases auctioned off late last year that permit fracking the Ohio River Watershed within a few hundred yards of the water supply of major cities including Cincinnati and Louisville. The coalition, which includes local residents from the fracked areas, concerned Columbus citizens and representatives from Keep Wayne Wild and the Sierra Club. More than a dozen protestors converged on the Federal Building at the corner of Spring and High to deliver petition signatures to Senator Portman on the issue as he has refused to take a public stand or comment directly to the press on the selling of public land for private profit. Phone calls to his office were not returned at the time of this printing. The September 8th protest was part of a two day initative by Coalition with actions at the PNC Bank building in Cleveland on the same and at the Marrieta District Ranger Station today. PNC bank has joined a group of 21 other banks in providing a rolling credit fund to Energy Transfer Partners, who are developing the Dakota Access Pipeline as well as group of pipelines across Ohio to compress and move the fracked resources for export. The group had speakers which linked the fracking of fossil fuels to climate change. Climate Change is illegal to discuss in government documents in Florida which is currently being ravaged by Hurricane Irma and is due to be struck by Hurricane Jose next week. Along with Hurricane Harvey and Hurricane Katia striking Texas and Mexico respectively yesterday and two weeks ago, the current Atlantic hurricane season has produced and unprecedented 3 category 5 storms and one category 3 storm in four weeks. The State Government of Florida fires employees for saying what was said by activists outside the Federal Building in Ohio. Since Senator Portman has said nothing perhaps he fears retaliation from the Governor of Florida should he utter the words climate change. Perhaps he is beholden to the three other banks with an investment interest in Energy Transfer Partners that contributed at total of $408,000 to his campaign or the two fossil fuel companies that also donated, including Marathon Petroleum which has a 1/3rd interest in the Dakota Access Pipeline and gave Senator Portman 74,635 for his latest six year trip to Washington to work for them. Speakers from the area discussed the degraded air, water and general scenic quality of places near fracking wells, pump stations and pads. One comment that she had moved back to the city because the air quality near her home. The group gave some good speeches about the interconnectedness of all racial and environmental justice, which are both things Senator Portman is not paid enough to even pretend to care about, and alternative energy.